Home » Food & Drink » How Have You Lived This Long without a Shower Wine Glass Holder? How Have You Lived This Long without a Shower Wine Glass Holder? A luxurious shower is one of life’s great joys, but we’ve been unable to enjoy it to its fullest because we’ve had to leave our wine directly outside on the sink… until now. 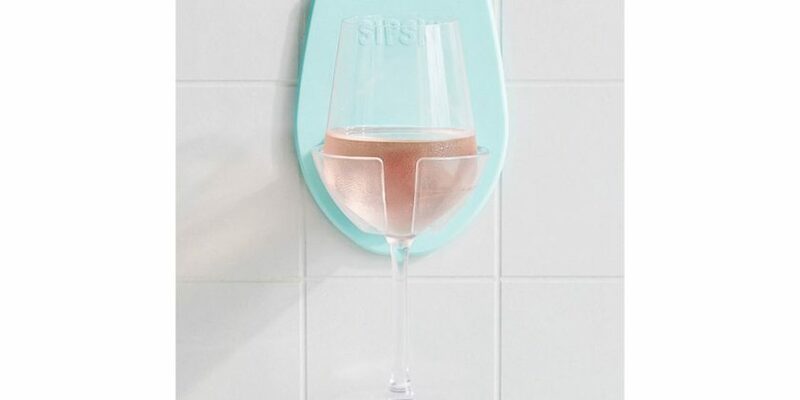 This Sipski Shower Wine Glass Holder from Urban Outfitters has eliminated the need to even pause your wine consumption for a second while you shampoo. The waterproof holder is made with a silicone backing that adheres tightly to any slick surface — like your tile bathroom wall — so you can place a stemmed wine glass in it without fear of it slipping. (That means we can overpour a little, too, right?) If you’re more of a beer drinker, Urban Outfitters also sells a silicone shower beer holder — and both are only $15, which means we’ll be adding two or three to our carts to gift our wine-loving friends for Christmas. The wine holder is already such a hit that it sold out and is now currently available for pre-order. So if you’re ready to sip and scrub, keep scrolling to snag one of these genius holders for yourself before it inevitably sells out again. Also, you might want to buy some plastic wine glasses while you’re at it… because suds + shower + breakable stemware = the opposite of that relaxing shower that inspired you to buy the wine shower glass holder in the first place. It’s never been easier to sip a little wine while you exfoliate in the shower. This Sipski Shower Wine Glass Holder from Urban Outfitters suctions to your tile wall so you can conveniently reach for your shampoo and wine at the same time. Pre-order your own shower wine holder today, and snag a few extras for your friends, too! Take your shower beer to the next level. Whether you’re sipping from a Solo cup or a beer can, Urban Outfitter’s Sudski Shower Beer Holder is the best place to set your drink while you rinse and repeat. If you mix between beer and wine (which we don’t recommend doing in the same night), this Carry360 Bath & Shower Wine Beer Holder is the perfect size for either drink. Its powerful suction cup backing keeps it secured to the wall, making it durable enough to hold up to six pounds — which means you can fill your glass to the top, or maybe stack two beers on it. Disneyland's Halloween Treats Are Here, and OMG, You're Gonna Want to Try Them All!